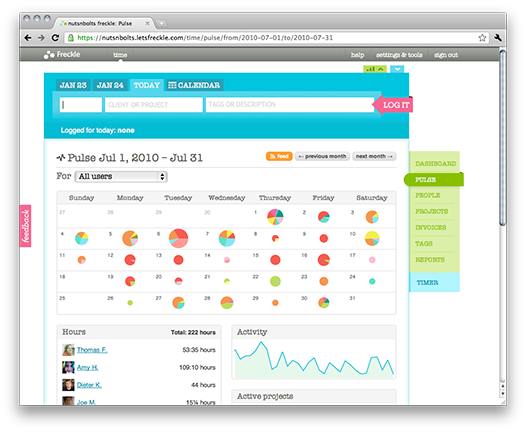 Get a 360° view of your productivity with Freckle. Do you have the data you need to answer the following questions? 1Which days are you the most productive? 2Do you work best on many goals in a day, or just one at a time? 3How are your time estimates compared to reality? 4How much time are you spending on administrivia? 5How much do those “just one minute” interruptions cost you? 6Does your product have any time sinks that just don't pay? 7Where do your team members spend the most time, and when? 8Is everyone pulling their own weight? You can get your data into Freckle without ever opening a web browser — you don’t have to change the way you work. $ git commit -m "your commit message f:15m"
$ svn commit -m "your commit message [f:15m]"
Or use our performance-tuned Quick Entry box, logging time in as few as 6 key strokes. Or our keyboard-friendly Timer bookmarklet. Import your Harvest, Freshbooks, Basecamp or csv data. Or use our API. Learn more in our tour. this button to logging your first time entry.